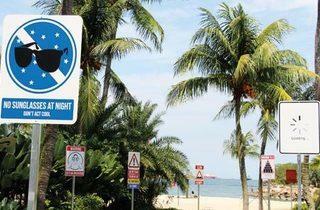 Sentosa’s Siloso Beach got a quirky, arty makeover by the now famous SKL0 (aka ‘The Sticker Lady’, Samantha Lo). 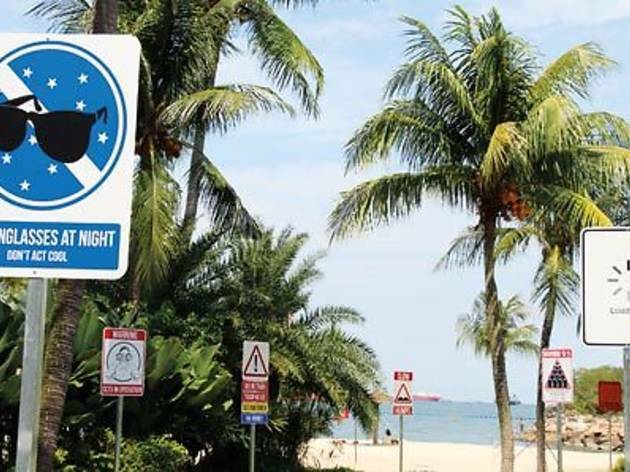 Titled ‘Signs on the Loose’, she created signs and stencils along the walkways that are all infused with a strong dollop of Singaporean-ness and her signature wit. This follows on from Lo’s National Day installation, ‘Lepak Corner’ at Beach Plaza, which encouraged folks to ‘relac one corner!’ (among other things to do: play safe, eat, fly kite, people watch, sing song, find lobang [good deals], queue for food or complain – all ‘like they do in the ‘hood’). Her cheeky artworks will be on display until the end of the year – this time with the blessings of the authorities.